I stood in the shadow of St. Giles Cathedral in Edinburgh, Scotland. Clouds gathered overhead and people walked curiously through the front doors. Here, the famous reformer, John Knox faithfully tended the flock until his death in 1572. Once inside this massive cathedral, I was transfixed by the sheer beauty of this place. I was overwhelmed by the architecture – the awe-inspiring flying buttresses that point worshippers to the transcendence of God. A single elevated pulpit is located in the center of the sanctuary. It stands strategically above the worshippers, which symbolically places God’s Word above sinful creatures. John Knox brought reform to Scotland and re-energized a nation that had all but forgotten God. Knox helped awaken a nation that neglected God’s truth which led to a virtual eclipse of the gospel. Martyn Lloyd-Jones describes Knox as a man who preached “with the fire of God in his bones and in his belly! He preached as they all preached, with fire and power, alarming sermons, convicting sermons, humbling sermons, converting sermons, and the face of Scotland was changed …” Simply put, the faithful preaching of Knox brought much needed reform to the Scottish landscape and renewed evangelical fervor to the church. John Knox courageously raised the banner of the gospel and defended the truths of the Protestant Reformation. He was unashamed of the gospel (Rom. 1:16) and fearlessly proclaimed the Word of God. He stood boldly and with Peter and the apostles, obeyed God rather than men (Acts 5:29). Indeed, Knox is a true exemplar of faithfulness in the face of adversity. As I made my way out of St. Giles, my mind was filled with stories surrounding the life and ministry of John Knox. As I turned to gaze again at the rising fortress where Knox served the Lord, a thought occurred to me. It was not a new thought. Rather, it was a lesson that has moved me for many years now but in this moment, the lesson was magnified as I scanned the edifice of St. Giles. The lesson is this: church history matters. It seems like such a simple lesson. But it is a lesson that many contemporary Christians are unfamiliar with. Even as a young Bible College student, I failed to understand the importance of church history. The buildings seemed so old and the names were so hard to pronounce. It is a sentiment that is not unique to me. I hear it all the time. I hear the cruel remarks about John Calvin and the caricatures that biased people have cooked up about Jonathan Edwards. But when we move past all the petty talk and face reality, we realize that church history truly does matter. First, Church history matters because when we forget the past, we fail to learn valuable lessons that impact our lives. George Santayana famously said, “Those who cannot remember the past are condemned to repeat it.” So Christians who minimize the importance of church history are vulnerable to the theological error that plagued the church in the past. Additionally, they repeat the sins committed by our forefathers. The Son was created by the Father. The Son owed his existence to the will of the Father. The Son was not eternal, that is, there was a time when he was not. Such teaching stood diametrically opposed to Scripture and was outside the bounds of orthodoxy. In the end, Arius rejected the full deity of the Son and the Holy Spirit. Remembering godly leaders in church history is not optional; it is a command in sacred Scripture. The author of Hebrews does not limit the scope of these “leaders” to men like Moses, Abraham, Paul or Peter. He instructs us to remember leaders “who spoke to you the word of God.” So remembering leaders like Augustine, Calvin, Edwards, Luther, and Spurgeon is an important part of the Christian pilgrimage. We do well to follow in their paths by boldly proclaiming the truth and living faithfully before the Lord, even when our detractors heap insults on us for faithfully remembering these heroes of the faith. Third, Church history matters because God ordained specific events that lead to the worldwide spread of his glory. Church history truly is “his story.” Whenever we discount history, we subtly stand in judgment over God and claim to know a better way. Whenever we disparage church history and subtly place ourselves in a position that was never ours to enjoy. Indeed, “Our God is in the heavens; he does all that he pleases” (Psalm 115:3, ESV). 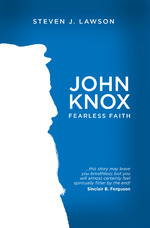 John Knox was a faithful man who led a gospel-centered life, according to the grace that was given him by his Savior. His relentless preaching helped drive away the darkness and restore the light of the gospel to his land. Almost five hundred years later, St. Giles still stands but the truth has fallen on hard times. Once again, the gospel is being eclipsed by man-made philosophy and foolishness. As Christ-followers, we must learn well the lessons that church history teaches us. When we forget the past we falter in our faith and fail to exalt the sovereign purposes of our Savior. When we forget the past, we become comfortable stumbling around in the dark and begin to glory in our ignorance. Let us become educated in the School of Hard Knox. And may the gospel shine brightly again. “For the earth will be filled with the knowledge of the glory of the Lord as the waters cover the sea” (Habakkuk 2:14, ESV). And may we recover our love of truth and our passion for the gospel. Color photographs appear throughout this work, sparking interest in the Scottish Reformation and the theological genius of John Knox. A perfect traveling tool for anyone making a trek to the United Kingdom. John Knox courageously raised the banner of the gospel and defended the truths of the Protestant Reformation. He was unashamed of the gospel (Rom. 1:16) and fearlessly proclaimed the Word of God. He stood boldly and with Peter and the apostles, obeyed God rather then men (Acts 5:29). Indeed, Knox is a true exemplar of faithfulness in the face of adversity. Buried deep in the catacombs of church history lie heroes that deserved to be revived from time to time. John Knox stands among several men who faithfully raised the banner of the gospel and defended the truths of the Protestant Reformation. Martyn Lloyd-Jones and Iain Murray guide readers through the life and legacy of the great reformer, John Knox. Chapter two is Lloyd-Jones attempt to credit John Knox as the founder of Puritanism. The author points to several noteworthy qualities in the Scottish reformer – ability, energy, shrewdness, wisdom, originality, and courage. But his preaching stands out: “His great characteristic as a preacher was vehemency. Great preachers are generally vehement; and we should all be vehement. This is not the result of nature only; it arises from the feeling of the power of the gospel. Vehemence is, of course, characterized by power; and John Knox was a most powerful preacher, with the result that he was a most influential preacher.” Lloyd-Jones continues, “When the Lords and others were alarmed, and frightened, and all ready to give in, Knox would go up into a pulpit and preach a sermon; and the entire situation was transformed. One man ‘more influential than the blustering of five hundred trumpets in our ears. '” The reader is left to determine whether or not Lloyd-Jones is successful in defending his thesis. Iain Murray concludes with biographical overview of John Knox. Several themes emerge including the fervent prayer life of Knox and his commitment to Reformed theology. Murray, like Lloyd-Jones emphasizes the preaching ministry of Knox: “His authority came from the conviction that preaching is God’s work, the message is his word, and he was sure the Holy Spirit would honor it. This was the certainty which possessed him.” Indeed, such a certainty should possess every preacher of God’s Word. John Knox and the Reformation is a powerful look at a potent preacher. It is an important reminder of the need for courage in the face of adversity and faithfulness in a faithless generation. John Knox stands as an inspiration for Christ-followers and is an exemplar for pastors who make it their aim to faithfully feed, lead, and protect the flock of God. The Mighty Weakness of John Knox is the third installment in The Long Line of Godly Men Profiles. Dr. Steven J. Lawson serves as the series editor and hit the ground running with his superb volumes that survey the life and theology of John Calvin and Jonathan Edwards. Douglas Bond, no stranger to the Christian publishing world, makes a solid contribution in this most recent work. Chapter one surveys the life and the legacy of John Knox. The author highlights pivotal moments in the life of the Scottish Reformer that include Providential persecution, his call to preach, ministry in England and Scotland – not to mention his ministry in Geneva alongside the godly French Reformer and pastor, John Calvin. Additionally, Knox held to the doctrine of particular redemption. As such, Knox denied that Christ died a hypothetical death. Rather, his death atones for his elect: “Election is particular,” writes Bond “and the work of Christ, of rigorous necessity, is particular.” Bond’s approach is both commendable and encouraging as he spells out the theological presuppositions of Knox. His graciousness is certainly worth emulating. Finally, John Knox is rightly presented as one who was a humble servant of God who faithfully preached the gospel, trained disciples, and glorified Christ with a holy passion. His passion for preaching and writing is explored. And his concern for the poor is pondered. It is helpful to see Knox as one who struggled with fear but was used in a mighty way for kingdom purposes. Douglas Bond summarizes the weakness of Knox; weakness that was ultimately used for God’s glory. “Knox was transformed from weakness to might by God’s power.” May we who are weak be transformed into kingdom shaking vessels whose aim is proclaiming the message of the gospel and glorifying the great God of the universe. May the example of John Knox embolden weak pastors to teach and preach with faithful fervor.